‘Vision of Aomori’ introduces artists related to Aomori in a series. For this 15th event, a solo exhibition of FUKUDA Sayaka who is from Aomori City and currently based in Okazaki City, Aichi Prefecture is held. 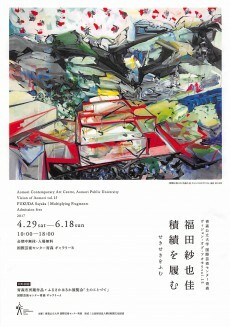 Fukuda’s landscape painting explores memories and sensations of actual landscape, and information acquired through a number of researches concerned with the place is transformed and depicted in unique colors and forms. The information of different time frames is integrated onto the picture to create another landscape. More recently, photographs that were used for the production of painting have been turned into another form of artwork, which shows her new development. This is the first time for Fukuda, who has presented her works in Tokyo, etc., mainly in Tohoku Region, to exhibit her work in Aomori where she comes from. Her new works by various media as well as her past works appear in the exhibition space as if they were fragments of the landscape found in her work. We would be happy if you would come over to see them.